We left England a day or two before Easter to head to Spain for a couple of months. It was raining but hey, we were going to stop in France for a little break. Biscarosse on the west coast of France just South of Bordeaux. Oysters, Europe’s biggest sand dune and stunning beaches. A little pit stop in one of our favourites, Burgos (yes, it rained!). A beautiful cathedral and some gorgeous bronze sculptures. Chilly weather stayed with us, snow accompanied us north of Madrid. Home in our little Cortijo it felt like Spring had arrived, and then it rained…. and it rained, and rained and rained. We’re getting towards the end of May and it’s still raining! The springs are full of water, and the trees are blooming. We’re over run with oranges and lemons, which is a lovely problem to have. Marmalade has been made, naturally and much orange juice has been drunk. We’ve fiesta-ed and partied in the country and down by the lake when the sun has made a few brief appearances. We’ve eaten an enormous tortilla and cake (citrus, of course). We’ve braved the snow of the Sierra Nevada…a first for me. Then Big Man celebrated a birthday so we headed up to Las Alpujarras (more snow but plenty of fun) then a final fiesta with poppies and even some sunshine. We’re still dealing with stormy weather but last week we finally had our internet reconnected (not for want of trying) and then here we are…a few months down the line but back up our mountain. It’s been a long time, and this has been a whistlestop catch up. It’s good to be back with you all! I always feel a bit of a fraud posting salad recipes as most of us conjure up salads from what we have in the fridge most of the time. Well, it makes sense. But sometimes there are some really tasty combinations of ingredients just work so well together, it’s worth searching them out to make them specially. The first one was inspired by a conversation with my parents at Christmas. We were eating some particularly good smoked salmon and they were reminiscing about their work in London in the 1970s and 1980s when they used to run some very funky nightclubs. I was the envy of the class having a young mum who wore silver platform boots and Green Mary Quant nail varnish to go to work but in typical fashion always wanted to be round visiting best pal Ria’s mum who baked cakes. There’s no pleasing young folk, as I am sure many of you will agree! Their memory was of Ella Fitzgerald (oh yes, I’m shamelessly name dropping here) asking for English mustard to go with her smoked salmon, so of course we got out the mustard and I have to say, Ella certainly knew what she was asking for! Rocket leaves, asparagus spears (blanch the chopped stems first for a few minutes then add the tips for the last minute or so) slices of smoked salmon arranged to your liking on one of your favourite plates. Drizzle a little olive oil over and a squeeze of lemon juice, a sprinkle of salt and a few grinds of black pepper. Serve with a dipping mayonnaise (homemade or otherwise) mixed in a ratio of about 5:1 with English mustard. Put on your favourite Disco collection cd and get on down. If you enjoy asparagus, try this recipe out and see what you think. Back in Spain here it’s orange season and we can’t get enough of them. They’re being sold at outrageously cheap prices for massive bags of them so we’re juicing them, eating them au naturel and in fruit salads and savoury salads. Here’s a favourite which we serve with grilled pork – the flavour of the sweet and sour oranges, the sharp onion and the creamy avocado contrast really well with the richness of the meat. Sprinkle some coarse sea salt over and a drizzle of olive oil. If the oranges are particularly sweet squeeze over a little lemon juice and finish with a splash of balsamic vinegar. I used a Balsamic vinegar reduction which is not only pretty to look at as you can get all cheffy with it, it also has a very delicious intense flavour. Go on, Spring into Spring and start to throw off those warming winter hotpots and give your favourite salads a chance again! Summer keeps taunting us here Up the Mountain. And then the grey and dismal part of Spring rears its head again. A bit like me, the weather has been neither here nor there. Time for some summer cooking, we dragged out the barbecue ready to grill some sardines and pretend we were on the beach. Of course, in typical English weather fashion, the wind whipped up, the grey clouds sailed overhead and it all went pear shaped. Oh well, we turned on the oven which also took the chill off the house and all was well. Simply place your sardines (or you could use herring or mackerel) in an ovenproof dish and place slices of orange and sprigs of mint between them. You could stuff them if you prefer. Sprinkle with salt and pimentón, drizzle a little oil over and any juices from the orange. Bake on high for about 15 minutes until the juices from the sardines run clear. And at least you won’t have to worry about sand in your shoes…. Wrapped Up and Ready to Travel! Customs vary immensely the world over, but some are the same regardless of where you are. When visiting friends for a meal, a little gift is customary. If it´s home made, so much the better, especially if it´s edible. My mum passed a recipe on to me when I was last in London. She thought it would appeal because the finished cake is not too sweet (she knows I don´t have a hugely sweet tooth), uses oil instead of butter (so much easier here where butter is rarely used) and contains ingredients which are local to Andalucía – oranges, almonds and raisins. Perfect, all I needed was a chance to make it. Easter weekend was a mix of quiet and hectic for us. Saturday found us heading across the “frontier” from Málaga province to Granada, to a remote area to join some friends in their Cortijo for lunch and a walk. More of the walk another day as I got rather carried away taking photos. The cake was made the night before and was a huge hit. It´s very moist and is a cross between a cake and a dessert and would also be perfect served with whipped cream, crème fraîche or ice cream. 150g raisins soaked in 50ml of amaretto (warm the amaretto and leave the raisins in soak for at least an hour) If you don´t want to use alchohol, a delicate tea would also be perfect for soaking. Preheat oven to 180ºC/350ºF/Gas 4 and line a 24cm springform tin. Place the whole oranges in a saucepan of water and ensure they are covered. Bring to the boil and simmer for about 15 minutes or until tender. Blitz 1½ oranges until finely chopped, reserve. Squeeze the juice from the remaining half orange then set the juice aside. Whisk the eggs until light and fluffy then whisk in the sugar. Fold in the almonds and olive oil then sieve in the flour then fold in. Gently stir in the pulped oranges and half the raisins and pour the mixture into the tin, spooning the remaining raisins over the top of the cake. Bake for about 60 minutes until a skewer inserted in the middle of the cake comes out clean. Remove the cake from the oven but keep in the tin. Place the juice of half the orange and the icing sugar in a pan and dissolve the sugar. Pierce the cake all over with a skewer and pour the orange syrup over. Leave in the tin to cool then remove and enjoy. PS. I think this would also be great made with polenta! I was going to give this post a Christmas heading, but it´s about fruit flavoured liqueurs, and who needs Christmas as an excuse to open a bottle and share with friends?! Every year for the last few years, I have made a batch of orange flavoured liqueur (which is made from vodka as it´s virtually impossible to buy pure alcohol here). It´s rather like Limoncello and the recipe comes from the BBC Good Food website. I won´t reproduce it here, just click on the link above and you can see how easy it is to do. And if you fancy a batch for Christmas to either drink at home or to put into pretty bottles as gifts…well, you still have time. I have also now “tested” my Cherry Brandy which I made back in the summer. Remember this? Well, all I can say is “wow”! I´m so pleased with how it has turned out and I know we´ll be enjoying it over the coming months. The cherries are amazing too and I am planning to serve a few this weekend with a citrus sponge cake and vanilla ice cream. 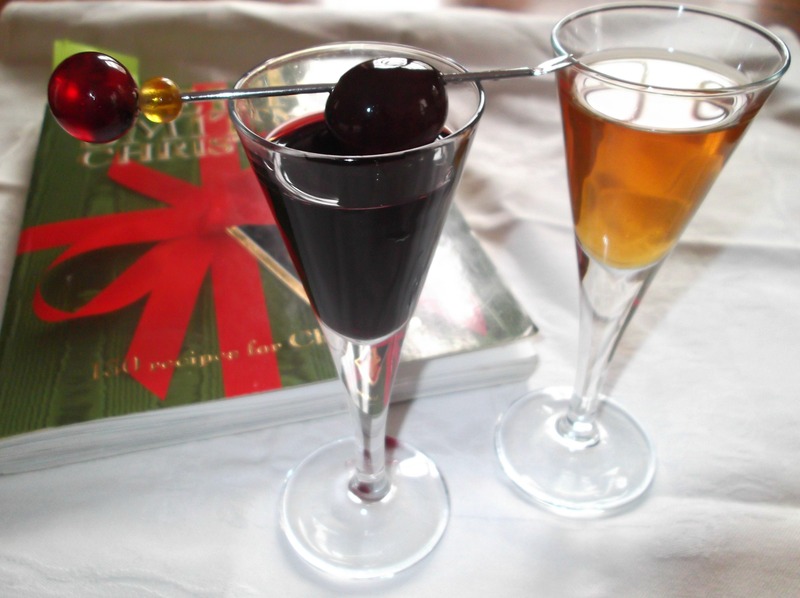 Digressing a little, Cherry Brandy always reminds me of my Great Aunt Joan, my darling Grandmother´s older sister. Joan was a stout old spinster, a little gruff, but caring deep down as she dedicated her life to running children´s homes. She spent her spare time entering competitions and must have been pretty good at it as she won things like holidays, cars and cruises. My lucky grandmother was often chosen to accompany her on these little jaunts, and it was mostly good fun for them both. I say mostly, because Aunt Joan was teetotal, and always frowned at anyone letting the smallest drop of alcohol pass their lips. My Grandmother, on the other hand, enjoyed a drink almost right up to her dying day aged 93 – she said it kept her young. They were on a cruise on the QEII, when a young boy was taken ill with appendicitis and the Captain announced that the ship would turn back to the last port so that he could be operated on. This would cause a delay of about 10 hours to their journey, and during this period the bars would be open free of charge to all guests. My grandmother happily planned an afternoon of white wine drinking and sun bathing when Aunt Joan had a bit of a panic attack. 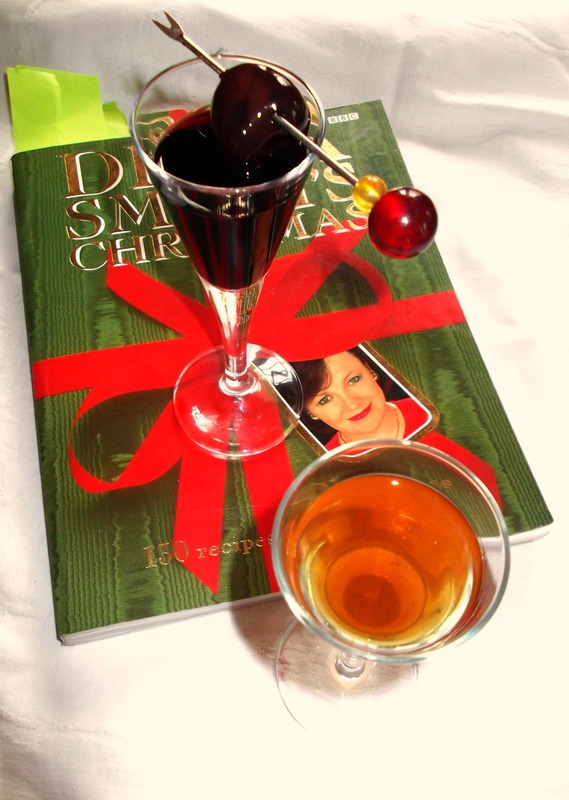 The already over worked Ship´s Doctor was called and prescribed a small glass of Cherry Brandy to calm Joan´s nerves. As it was being “prescribed” rather than poured by a bar tender, Aunt Joan felt that this was acceptable. It seems she took to keeping bottles of Cherry Brandy all over the place which she took frequent “nips” of as her “calming tonic”. My grandmother was able to spend her afternoon as planned as Aunt Joan lay in her cabin dozing, happy and taking little sips of her Cherry Tonic. Fish Man came up trumps the other day with a whole hake in the back of his little van. It was rather large, too much for just Big Man and me, so as it was fresh it went into the freezer. A few days later friends were coming over for lunch, and the sun promised to shine, so I decided to barbecue it. A quick visit to the garden to gather mint and lemons, and out into the olive grove for the tops of the wild fennel which is everywhere, and I was set. I had to gut and clean the fish, but if you´re buying from a fishmonger, I´m sure it will be cleaned for you. It´s not that tricky (wear kitchen gloves though, or you´ll smell like a hake for the rest of the day!) but not for the squeamish. Pat the fish dry with kitchen paper and salt the inside slightly. 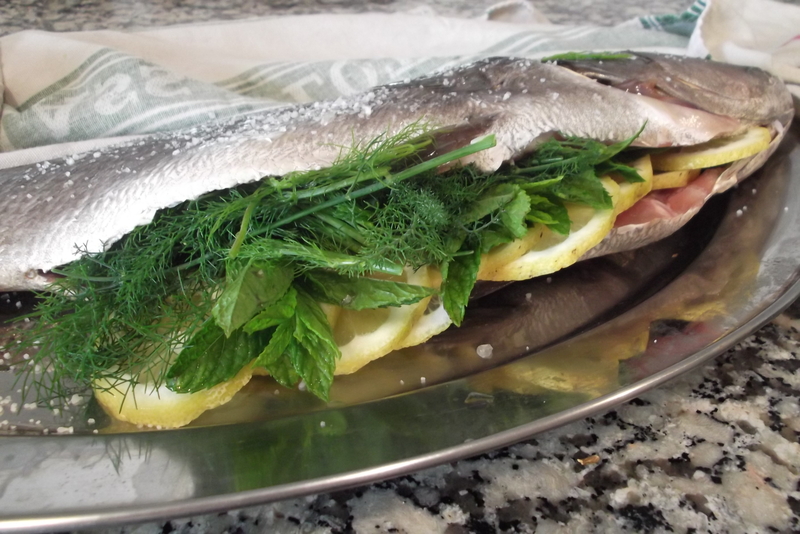 Stuff it with bunches of herbs and thin slices of lemons, then sprinkle the outside with coarse sea salt. No oil needed, but the salt will protect the fish and you´ll end up with lovely charred skin which I personally love to eat, but I know some people don´t. 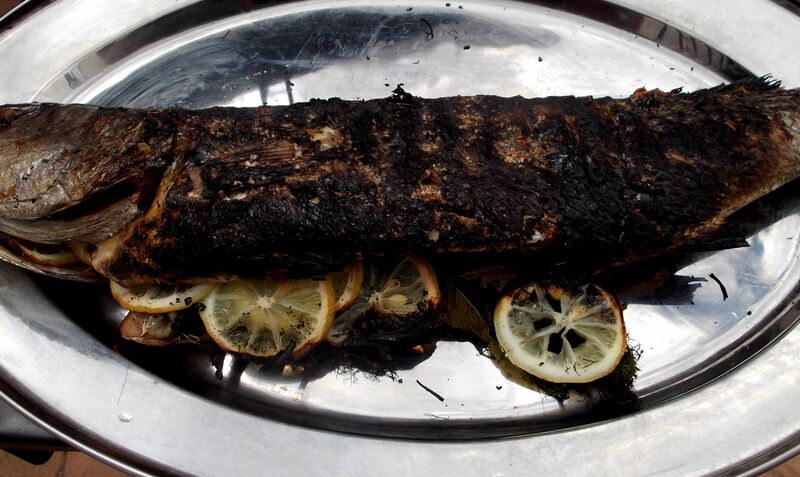 Then it´s on to the barbecue for your hake. We cooked it on a low heat and the lid on for about 15 minutes in total. If you do use hake, but you could do this with pretty much any fish, it´s firm, so easy to turn when it´s half done. Check it´s cooked by peeking inside – the flesh will be white when it´s ready. I served this with a delicious salad which was so beautifully coloured, it didn´t matter that the sun went in and a big cloud hovered over us all through lunch! 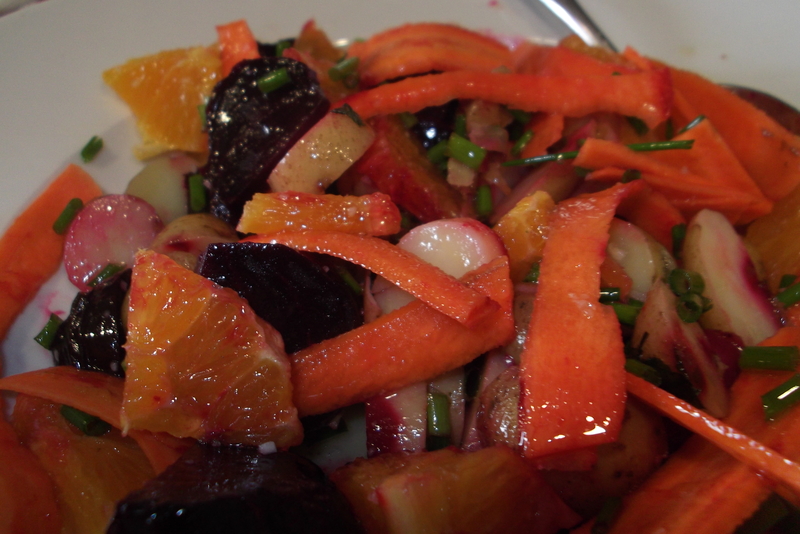 I used chopped new boiled potatoes, cooked beetroot, oranges, thin slices of raw carrot and chopped chives. I made a simple dressing of olive oil, lemon juice, mustard powder, a clove of garlic, salt and pepper. Food for a sunny, or not so sunny day! The end of the orange season and the start of a spring glut of broad beans and mint means that it´s time here for a refreshing, light and easy salad. Most people here have at least a few citrus trees in the gardens, some have tens or hundreds of them. After three years our lemon tree is now producing more than we can cope with, but we only planted our orange last autumn, so still rely on the good will of friends and neighbours for our supply. Fortunately, we have very obliging friends and neighbours who keep us in oranges. When I still went out to buy them, in the early years, I was surprised to be asked in the little local shop “if I wanted oranges for eating?”. Well, of course I did, what the heck did they think I was going to do with them? Of course, now that I am a wise old country biddy, I know that oranges are sold for eating (slightly more bitter) and for drinking (i.e. for juicing). The later are softer, juicier (naturally) and incredibly sweet. The difference is noticeable and as we eat a lot of salads made with oranges here, it´s worth looking out for the right ones. This salad can be varied depending on the time of year. 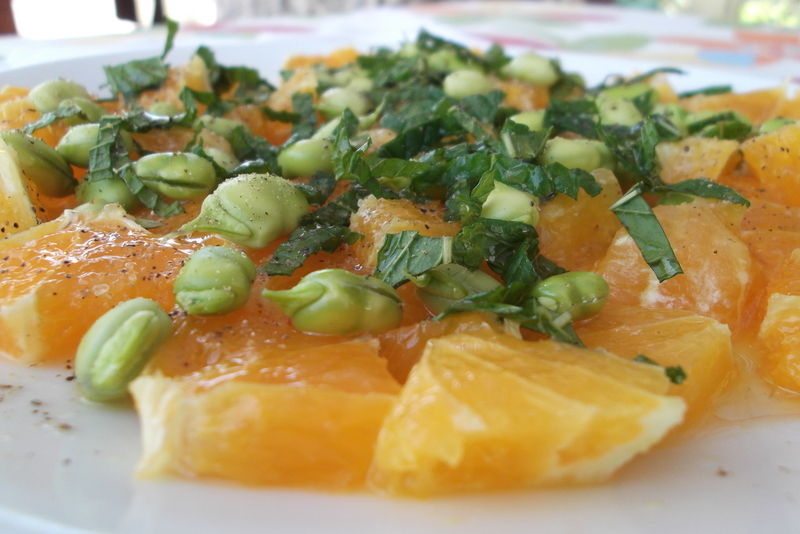 In the autumn, with the next crop of oranges, I substitute the broad beans for pomegranate pips. Either way, the colours and combinations of tastes are stunning. 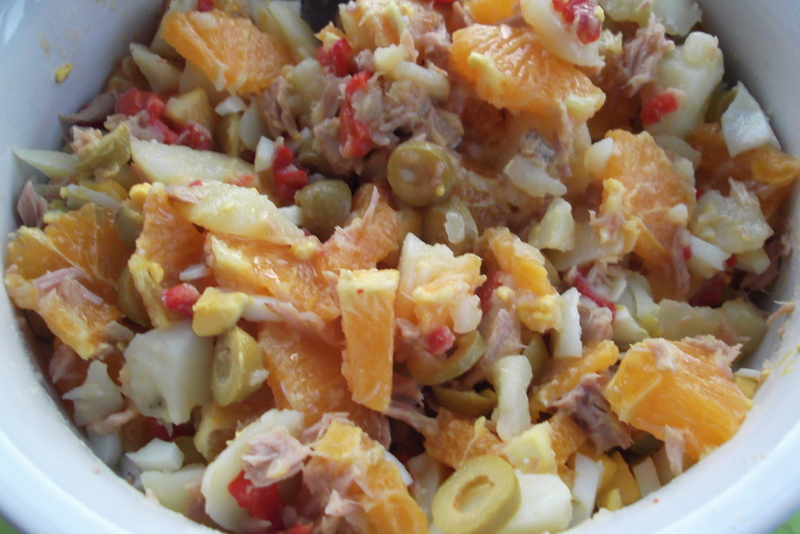 This salad goes particularly well with oily fish like sardines or mackerel or with fatty meat like lamb or goat. As a starter it´s delicious with a plate of salty jamon and another of a salty cured sheep´s or goat´s cheese. A cold glass of iced dry sherry finishes things off perfectly. Place the oranges on a plate, pouring over any juice that you have collected when peeling them. Sprinkle over the beans and mint, season and drizzle over the olive oil. Make the salad about half an hour before eating and keep chilled before serving. It´s an unusual mixture of tastes, but it works for me. Do hope you enjoy it! A day when I feel like an exhausted mother who has been given an hour´s respite while her partner takes the children to the park for an hour. Big Man has taken the dogs out for a walk and I´ve just made myself a cup of Lady Grey tea and plonked myself down on the sofa. I´m sure real mums have it a lot worse, as it´s constant, but I have spent a lot of time with little people today and it´s worn me out! Probably because I´m not used to it, at least that´s my excuse. Having said that, it´s been a fun day. Tomorrow in Spain it´s the feast of San José, Saint Joseph, which means it´s Father´s Day here. One of Big Man´s sisters is a teacher at the local primary school and I went along to help her out with classes today to get gifts and cards sorted out for the Dads. The day was focused on healthy eating, balanced diets, and talk about vitamins, minerals, calcium, protein etc. All pretty advanced for 7 year olds I thought, but they loved it. 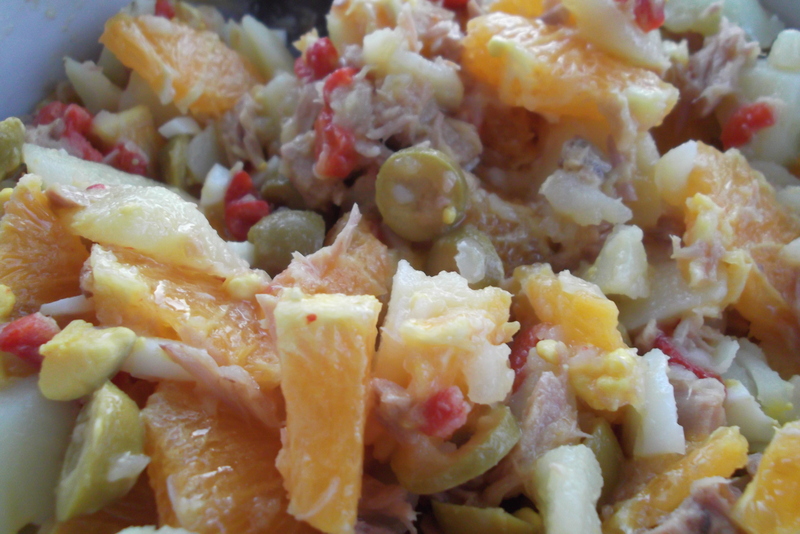 We made Fruit Salad, which is called Macedonia here, and the children ate this in their morning break. We also squeezed some oranges that one of the dads grows and made a Moroccan dessert of sliced oranges sprinkled with a little sugar and cinnamon. All were made with much laughter and consumed without a single cry of “I don´t like fruit”. Cards with hearts and sunshine were also made and finally we moved on to some Moroccan pastries (a recipe from one of the mums who comes from there) made with ground almonds, eggs, butter, grated lemon and coated in icing sugar. Good, sticky, messy fun. This afternoon was spent with Big Man´s niece who is studying English at the University of Malaga and we had a conversation class. To get the ball rolling, I asked her to help me prepare some jam, which she happily did, and we covered a whole new cooking vocabulary which is not usually studied in a typical language class! Start by putting the apple and water into the saucepan and bring to a simmer. As it simmers, mash with a fork or potato masher. This will only take a few minutes. 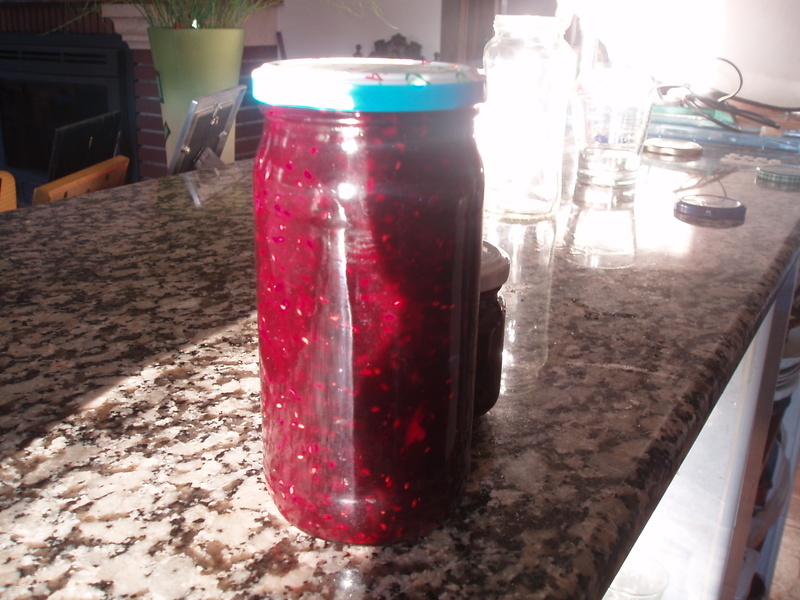 If you´re going to sterilize your jars in the dishwasher, put them in now as this jam doesn´t take long to make. Put your saucer in the freezer for testing the setting point of the jam later. Add the lemon juice, fruit and sugar to the pan and warm gently until the sugar has dissolved. Once the sugar has dissolved, turn the heat up and bring the jam to a boil. This only needs to boil for 5-10 minutes to reach setting point which you can test with either a jam thermometer or by putting a teaspoonful onto your icy cold saucer. 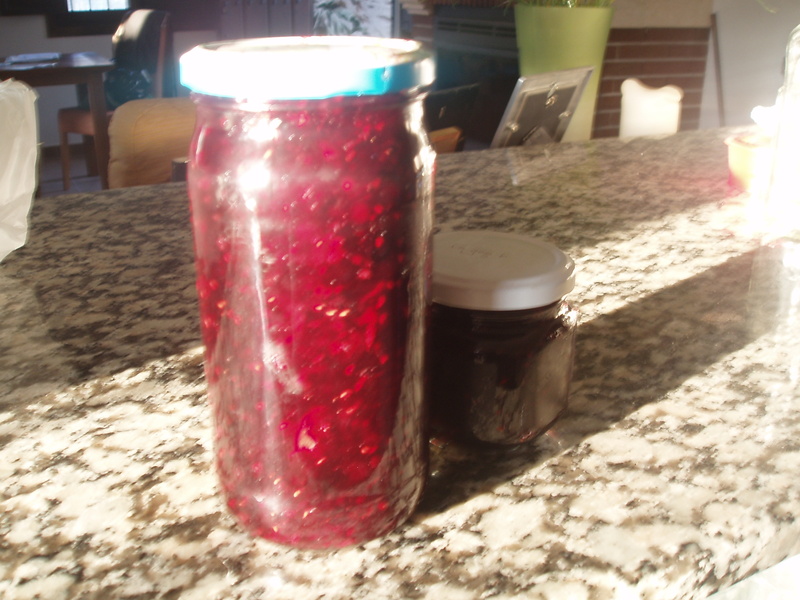 If the jam wrinkles when it has gone cold and is pushed slightly with your finger, it´s ready. If not, boil for a couple more minutes then retest. 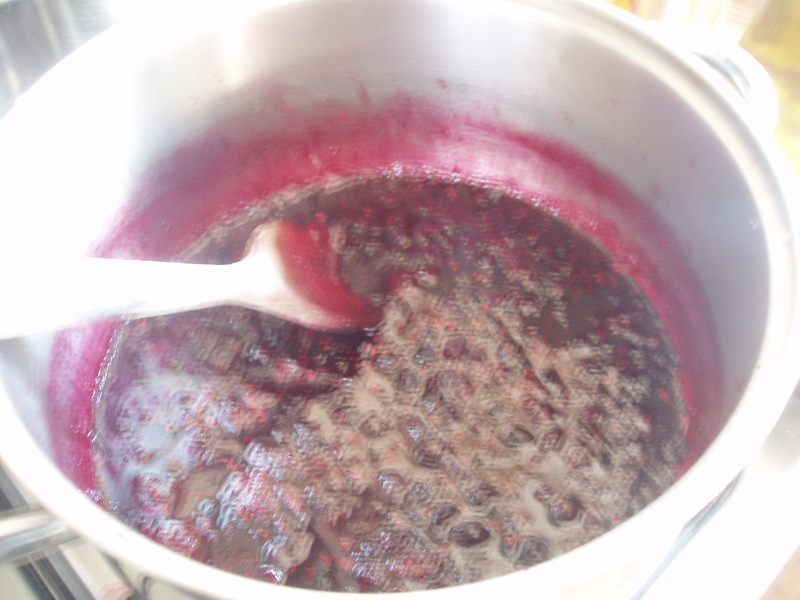 Be really careful with the boiling jam as it burns incredibly if it splashes onto you. When it´s at the right point, leave to cool down a little while the dishwasher finishes its cycle and then pot your jam, screw the lids on while still hot but label the next day when the jam has cooled down completely. Now all you need to do it bake some delicious scones to go with your beautiful jam!